One of the great joys of my life that I look forward to with keen pleasure is continuing to read everything that Charles Dickens wrote. I was introduced to him about ten years ago, the way that anyone should properly be: through Great Expectations and then David Copperfield. I was hooked. The two words that best describe Dickens are genius and energy. Anyone feeling that they’ve over-achieved in life will consider that Dickens wrote The Pickwick Papers when he was 25. Before he was 30 he had added Oliver Twist, Nicholas Nickleby, The Old Curiosity Shop, and Barnaby Rudge. How is that even possible? He went on to write a total of 15 novels, among the best in the English language, 10 of which are more than 800 pages long. This is on top of his other novels, stories, plays, travel writing, essays, and letters. He edited magazines, gave dramatic performances, speeches, and readings all over the world, walked 10-20 miles a day, while being an insensitive husband and problematic father to ten children. He lived, wrote, and worked at an indefatigable pace before it all suddenly ended with his early death at age 58. A national treasure, he was buried in Poets’ Corner at Westminster Abbey. 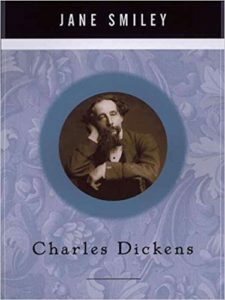 There are many gateways into Dickens’s fascinating life, and those who want to dive deep can plunge into Edgar Johnson’s 2-volume Charles Dickens: His Tragedy and Triumph (1953) or Peter Ackroyd’s Dickens (1991), which clocks in at 1,195 pages. For those who prefer biographies that don’t double as doorstops, pick up this slim little volume in the Penguin Lives series. Author Jane Smiley is no slouch herself, having won a Pulitzer Prize for her 1991 novel, A Thousand Acres. She clearly admires Dickens, and for her readers who are also aspiring writers, this book doubles as a graduate seminar on what novels are and what great novelists aim to achieve. She critically analyzes all of Dickens’s writings and stays close by his desk as he struggles to please his growing audience and feed his growing brood. Along the way, he found a powerful voice that combined, in Smiley’s words, artistic vision with social action and brought that vision to life in some of the most memorable literary characters ever created. Smiley argues that his only peer among English writers is William Shakespeare, while Claire Tomalin in Charles Dickens: A Life (2011) wrote that only The Bard created more memorable characters than Dickens. Do yourself a favor and find out if they are right. Make the acquaintance of the Pickwickians, the Artful Dodger, Samuel Weller, and all the rest. The remaining years of your life will thank you for it. This entry was posted in Books, Culture, People on March 27, 2018 by Stan Deaton. I was first introduced to Charles Dickens in high school with A Tale of Two Cities. I was so confused! I have since been too scared to try him again. Maybe I should. . .